This article is about loading, specifically keg loading. Anything can be used, atlas stones, sandbags or any awkward objects. You don't need to be a strongman to want to do this. I believe doing heavy loading will really improve lower back strength especially if loading to a decent height of platform. The platform height I recommended for if you are between 5'8-ft is a minimum height of 48inches; but I think 52inches is a good height, If you are taller you may consider a taller platform, and obviously if your shorter a lower platform. You will need an item that you are going to load. I personally use some lighter kegs, 80kg and 100kg to warm up and a 125-130kg keg for the heavy sets. The weight will be dependent on your level and what you have available. But for this article I will be talking about kegs! I was able to acquire the keg by talking to a local pub and asking if they had any spare. They had one that was dropped off and was not theirs, so they didn't mind giving it to me, but you could ask a local brewery, explain it's for strongman training and it would be great help they will sometimes give you an old one. At worst you may have to purchase a second hand one on something like Ebay or Craigslist. Once you have your keg, you need to load it up. I wont go into how to open your keg as there are tutorials on the Internet. What I have found for a standard size keg is that if you fill it full of water it comes out at about 50kg, sand about 100kg if packed tightly, and concrete weighing the heaviest at about 115kg. In order to make my keg even heavier I hung a heavy chain down the middle of the keg as the concrete was setting. Once you have your item ready to load make sure you have a way of unloading it off the platform. What we do is have some pretty dense foam, so after every rep I quickly put the foam down or get a training partner to, then drop the keg off the platform onto the foam, roll it back off the foam then the foam can be moved quickly ready for the next rep. There is quite a specific technique to efficiently loading kegs. To grip the keg stand the keg up, tilt it to the side and use one hand to grab the handle, then use the other hand to grab the other side of the keg, so make sure that one hand is at the bottom and one hand is at the top; you don't want both hands in the same position. Next pick the keg off the floor using your legs and back and a bit of arms if you need to, in order to get it to your knees, make sure to sit back so it can sit on your quad's without falling off. From here move your hand that is closest to your body forward so it's holding onto the side of the keg that is facing away from you. 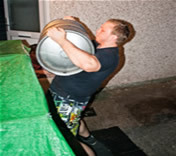 As you go to load the keg from this position you want to squeeze the keg into your body with your arms. As you stand up push your hips forward and start to perform a rolling motion to roll the keg up your chest. You will normally find to finish the lift you need to use your lower back, that is fine just do not put yourself into a really bad position where you are almost bent in half this will not be good for your back! If you notice you need to really lean back to finish the lift this could be because you are not close enough to the platform before you started to load the keg. If you don't quite get the keg on it can be possible that it is between you and the loading platform, if so use your chest to push it on. Once you have loaded the keg to the platform, get the keg off using the procedure mentioned above, and move onto the next rep. I recommend using this movement on a day you are doing deadlifts. Do these after deadlifts as they are quite taxing on the back. For reps I would recommend doing 3 sets of 3-5 reps at a heavy weight. You may get some bruising on your inner biceps if you're squeezing the keg with them, sometimes this cannot be avoided. The solution is to man up and enjoy the keg loading pain!